A traditional Saint Patricks Day Menu in America today is very different than the original Irish food and drink recipes prepared to celebrate the patron saint of Ireland. 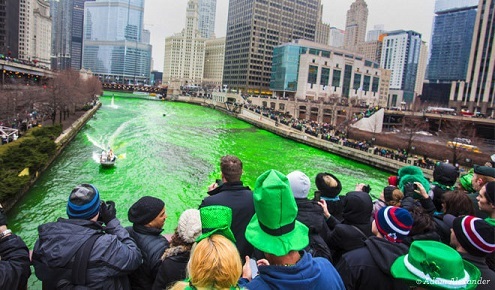 On March 17th every year, much of America adopts the green and becomes Irish, at least to have a reason for a party. The fact that many Americans are of Irish descent only partially explains our interest in St. Pat's Day. There is a spirit of celebration associated with the day that most Americans have taken to and made their own. But what we eat and drink in celebration is much different than the original Irish enjoyed many hundreds of years ago, or even today. Legend has it that St. Patrick became the patron saint of Ireland for, among other things, raising the dead and driving snakes out of Ireland. The shamrock became a symbol of the celebration because it is said that the Saint used it to explain the Trinity (Father, Son and Holy Ghost or Spirit) as he converted the Irish to Christianity. But another reason that the St. Patrick's Day celebration may have become so popular in America is that it takes place just a few days before the first day of spring, hence the color green (for spring) is an 'easy' one to adopt. For a Saint Patrick's Day Menu, Americans think of green beer and corned beef and cabbage. That food and drink was not and is not a common Irish tradition. Originally, most people in Ireland could not afford or did not have access to beef. Their food was most often boiled cabbage and potatoes and, if they were fortunate, a bacon joint would be added to enhance the flavor of the meal. Green beer was unheard of then and you'd be thought a fool in Ireland if you went to a pub and asked for one today. And in Ireland, until 1995, Saint Patrick's Day was a religious holiday. The pubs were closed! Only after 1995 was the day celebrated in a secular manner as well. In the United States, drinking has been the way of celebrating St. Patrick's Day since it originally began! The excuse for drinking came from a rumor that Saint Patrick brought the art of distillery to Ireland! It doesn't have to be true to encourage celebrating with drink. How and when Americans adopted the tradition of corned beef and cabbage and green beer as part of the celebration is somewhat unclear, but here is what we do know. The St. Patrick's Day celebration began in the U.S. in 1737 when the city of Boston decided to celebrate the day of Saint Patrick's death as the Irish had been doing for many years. Why the Irish celebrate his death (AD 461) instead of his birth (AD 385) is also a puzzle to me, but that is the custom. The Boston celebration spread to other cities in America every year until the entire country, it seems, was celebrating the day. Today, people in America celebrate the day with parades, wearing green, eating corned beef and cabbage and drinking (green) beer. 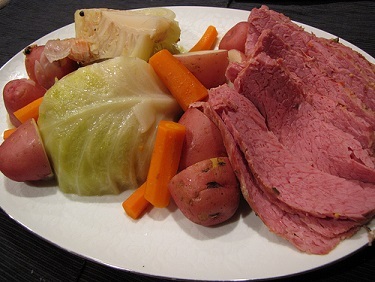 It was in the late 19th century that corned beef and cabbage began to become more popular with the Irish emigrants in America and Canada, where both salt and meat were cheaper than in their native country. They treated beef the same way they would have treated a bacon joint at home in Ireland. They soaked it to draw off the excess salt, then braised or boiled it with cabbage, and served it in its own juices with some pepper and bay leaf. From my reading, this best explains how we, in North America, came to adopt Corned Beef and Cabbage as a menu item on St. Patrick's Day. But in Ireland, they never adopted the idea as one of their own, but I feel compelled to include it on the menu because I know many of us in North America will want to prepare it. So pretend you're Irish if you are not, get out the green, put on a shamrock, and have a party with friends and family, or at least recognize the day by eating corned beef and cabbage, a Reuben Sandwich, Corned Beef Cabbage Soup, Corned Beef Hash for breakfast or another more truly traditional Irish meal such as Guinness Beef (or mutton) Stew and go ahead, toast the Saint and the Irish, not with a green beer, but with a stout beer (that's the Irish national drink and its black) or an Irish Coffee or Hot Double Irish or one of the other suggested beverages on this Saint Patrick's Day Menu. If it wouldn't be St. Patrick's Day in your house without Corned Beef & Cabbage, here's a famous restaurant recipe for corned beef and cabbage. This is a fabulous alternative to a corned beef and cabbage dinner, or as another way to use leftovers, provided you have leftover corned beef broth. Reuben and Rachel Sandwich Recipes are included on the Saint Patricks Day Menu just in case you actually have any corned beef left over. Breakfast? You want to use corned beef leftovers for breakfast? GREAT! 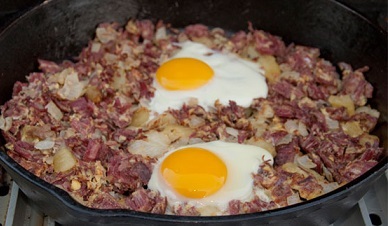 How about some Corned Beef Hash with some eggs in the morning? This is a real favorite restaurant recipe. Guinness Beef Stew. I am told that this Guinness Beef stew is an Irish pub favorite. I can believe it since my American-style restaurant sells a lot of it when I place it on the special sheet. Cooking beef in stout is similar to cooking meat in wine. It tenderizes the beef. 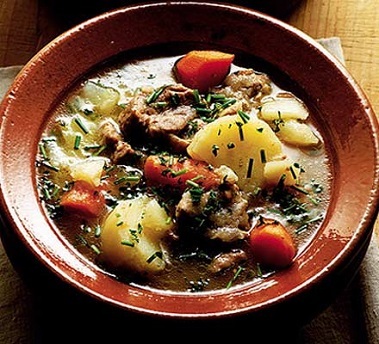 Cook the stew slowly and you'll have a malty, flavorful and tender stew to enjoy. And for beverage suggestions as part of this Saint Patricks Day Menu, here’s a quick guide to some favorite drinks. Just click a link to see the recipe. An Irish Toast To You And Yours! Enjoy your Saint Patricks Day Menu, each and every recipe offered, and the company of those you share them with. "It's easy to halve the potato where there's love."